Every summer when we attend a fair or festival there are a few special treats that we look forward to eating. Yes, fresh-cut french fries are at the top of the list. Drizzle a little malt vinegar over the top and pour ketchup in one corner of the basket and life is good! Homemade Bomb Pops made with our standard popsicle molds. And who can resist an elephant ear or funnel cake? It’s not every day that you can get those deep-fried special snacks. But one of the most refreshing treats that we get this time of the year is the Bomb Pop Popsicle! 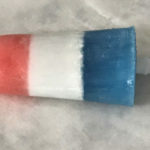 There is just something nostalgic about opening the paper covering to reveal the red, white and blue layers formed into the classic bomb pop shape. It is the perfect, refreshing treat on a hot summer day! This year, we are celebrating Independence Day at our neighbors house. The yard will be full of adults and kids enjoying the outdoors and sharing food. 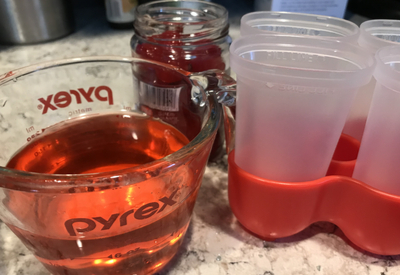 Cherry juice makes for the perfect red layer! I started making Homemade Bomb Pops a few years back when I was looking for other flavors to add to my Koji Popsicle molds. We had gotten tired of the lemonade, orange, and grape juice popsicles and Independence Day was right around the corner. We got creative and began the process to recreate the flavors and make the homemade bomb pops ourselves. I really wanted the classic look of the red, white and blue flavors and trialed several ingredients to come up with the right hues. Maraschino cherry juice makes for not only a great cherry flavor, but the perfect red coloring. Coconut milk is what gives the white layer its look and lime extract gives it another depth of flavor. Aluminum foil helps stabilize the popsicle sticks when freezing the white layer. The blue layer was the tricky part. I tried to use blueberry syrup, but the color was way too dark. In order to get that perfect blue color, we resorted to blue food coloring. And for the classic flavor – blue raspberry extract! The most important tip when making this recipe – have patience! Each layer requires a 2 hour freezing process before the next layer can be added. This will prevent the colors from bleeding into each other. But the end result of Homemade Bomb Pops is definitely worth the wait! 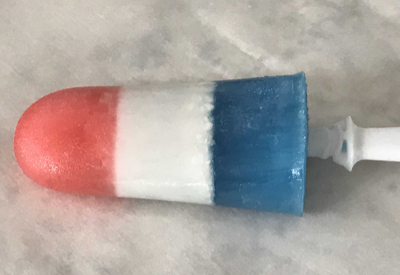 The classic bomb pop with red, white and blue layers that is fantastic for any patriotic holiday! To make sugar water, place water and sugar in a saucepan over medium-high heat and stir until sugar has completely dissolved. Set aside until completely cooled. In a small bowl, combine 1 cup of sugar water and cherry syrup. Fill up each popsicle mold 1/3 of the way. Freeze for at least 2 hours. In a small bowl, combine ¾ cup of the sugar water, coconut milk, and lime extract. Pour over the frozen red layer until the popsicle mold is 2/3rds full. 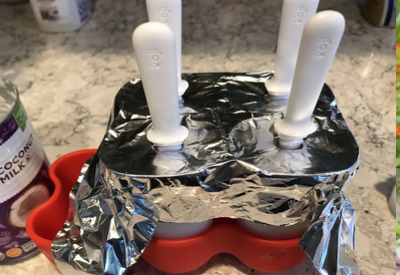 Place aluminum foil to cover the tops of the molds. Put a small slit in the center of each mold and insert the popsicle sticks. Freeze for at least 2 hours. Mix together 1 ¼ cups sugar water, blue raspberry extract, and blue food coloring. Remove the aluminum cover and fill each popsicle mold to the full line. Freeze for at least 2 hours.